Found in both soil and water and naturally occurring in many foods, selenium is a mineral that can be very important for certain body processes such as metabolism, and, it can also be useful for its antioxidant properties which can help keep out of control free radicals from damaging cells. There are some studies that have suggested that selenium might reduce the chances of developing prostate cancer and others that purport that it might be effective against various conditions such as dandruff and arthritis as well. Regardless of whether or not you are looking to boost your selenium levels or simply pump up your available antioxidants, there are a lot of everyday selenium rich foods that you can add to your diet, and we have compiled a list of the top 10 of them! 1. 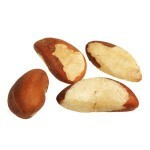 Brazil nuts: Even the best selenium supplement cannot hold a candle to Brazil Nuts. Boasting almost 800% of your recommended daily value, one ounce of these crescent shaped nuts can provide you with all the selenium you need. Stop picking around them in the mixed nut bowl and start enjoying these powerful purposeful snacks! 2. Tuna: Canned tuna is a cheap way to pick up almost a whole day’s worth of selenium. Containing 68 micrograms, a three ounce can of tuna is one of the most versatile selenium rich foods you can find. And, tuna is full of a whole host of other beneficial vitamins and minerals as well. 3. Turkey: Getting all of the selenium benefits that your body needs could not get any simpler than enjoying turkey. Just three ounces of roasted light meat can provide almost half a day’s worth of selenium. 4. Egg Bagel: You can top this pick for selenium rich foods with cheeses, meats, jams or butter and still get 39% of your recommended daily value, a whopping 27 micrograms per bagel. 5. Sunflower Seeds: Baseball players are likely not experiencing a selenium deficiency given their undying love of devouring these tiny and tasty morsels both on and off the field, even though it is unlikely that any of them realize that the contained kernels boast a third of the recommended daily allotment in just one ounce. 6. Macaroni: Having a problem finding kid friendly selenium foods? Well, your problems are over! One half a cup of boiled macaroni noodles packs 19 micrograms of the stuff and it is just as present even when slathered in cheese or butter so spoon away! 7. Ground Beef: One of the most common selenium rich foods appearing on dinner tables and menus everywhere is ground beef. You might not realize it when you are enjoying your hamburger, but for every 3 ounces of ground beef you hork down, you are adding 25% of your daily recommended goal of selenium. 8. Eggs: Selenium sources do not get any easier to come by than good old eggs. A fixture in cooking, baking and plain ‘ol eating, eggs are a delicious, inexpensive and very tasty way to get 15 micrograms of selenium per egg! 9. Oatmeal: Selenium rich foods can be found in every meal of the day, and oatmeal, one of the most popular choices for morning fare, is not only packed with varied nutrients that your body needs to stay healthy, it is also a little known source of selenium, containing 12 micrograms per cup. 10. Whole Wheat Bread: Picking up a loaf of whole wheat bread at the grocery store may make you feel like a health nut, and its okay if it does! Loaded with vitamins, minerals and good stuff like fiber, whole wheat bread is a tasty and smart addition to any sandwich and, with each slice containing 11 micrograms of selenium, an entire sandwich will register you at one third for the day!